The debate over the political economy in Asia is often harsh. A long-standing Western criticism is that Asian states use all manner nebulous maneuvers to inhibit local penetration by Western firms or goods that Asian countries would prefer they made themselves. This often applies to new devices or platforms particularly. Hot new items in new markets, where Asian states have few local participants, could mean an entire market is captured by a foreign firm’s trendy new device or service. The government of Korea, for example, blocked the iPhone for almost two years, most suspect, in order to give Korean tech firms time to build a competitor. (Apple, of course, would argue that Samsung simply ripped off its product.) The Korean government did not want a market (phone gadgets) it thought its firms should be good at, to be overtaken by a hot foreign product. This conflict goes back at least the 1970s, when the penetration of Japanese electronics and cars placed enormous pressure on Western firms. This is the era when Honda and Sony became household words in the West. Western governments were discomforted, but the clearly superior quality of Japanese products in these areas made raw protectionism a hard sell. Instead the argument was to open Japanese markets to Western goods, to pursue, in the language of trade theory, “diffuse reciprocity.” X opens its market to Y, and vice versa, and on the level playing field, firms would fight it out without recourse to government interventions, tariffs, import counting, and so on. But Japan balked at this notion. Much of its uncompetitive service and agricultural sectors were weak, and the deep kereitsu-government networks made it easy for large market players in Japan to push for protection. As tariffs became harder to defend with tightening GATT and WTO rules, Japan – and the many Asian states, like Korea, Taiwan, and now China, who have patterned their political economy on it – turned to non-tariff barriers (NTBs) such as health and safety restrictions, cultural quotas, “critical sector” opt-outs from trade rules, and so on. Frequently, these are preposterous. At one point in the nasty 1980s fights with Japan, the apparently unique qualities of Japanese snow meant that U.S. ski companies should not sell skiing equipment in Japan. Such flim-flam provoked U.S. counter-pressures, such as of voluntary export restraints (VERs), the Plaza Accord, and the general anti-Japan hysteria of the 1980s, captured most memorably in Rising Sun. This mercantilist strategy of high exports, plus gimmicky NTBs to block otherwise competitive imports, is well-described here. Korea unfortunately has adopted a lot of these bad habits, and the recent ban of the car-ride app uber by the city of Seoul is an almost textbook illustration of why Asian economics is better described as mercantilist than liberal, why Asian-Western trade friction is so persistent, and why Asia-Pacific free-trade rules are both desperately needed and simultaneously evaded. 1. Hot new products that threaten to up-end local markets are blocked by informally government-sanctioned oligopolies. Examples of this in Korea and elsewhere in Asia are notorious. Hollywood routinely encounters very strict quotas, ostensibly to prevent a “cultural takeover”; this is worst in China. The iPhone and iPad met a torrent of protectionism when they exploded onto the scene a few years ago. Mid-priced Western cars that might directly compete with Toyota or Hyundai were regularly impeded through all sorts of production and sourcing requirements to give Asian national champions a secure local market in which they could charge dramatically higher prices than elsewhere. Electronics too enjoy stiff NTBs. Things like foreign TVs, vacuums, computer parts, and so on are shrouded in bizarre NTBs like “education services” or wildly expensive shipping insurance charges. Seoul’s slap-down of uber follows this gimmicky, mercantilist pattern. Taxi cab services everywhere have fought uber. It challenges their local monopoly, but of course that is the whole point. This is why start-ups are so valuable and should be nourished, not quashed. They potentially bring new value to consumers and shake up staid markets extracting rents from consumers because of oligopoly. But this manner of creative destruction is particularly feared and resisted in Asia, where medium and especially large firms almost always have deep relationships with government and use that to protect themselves. This is frequently called “industrial policy” – a better term would be “government capture” by interest groups. It is no surprise that large firms in Asia almost never go bankrupt. Indeed Korea does not even have a bankruptcy law, because government bail-outs are so common. 2. Foreign products that are disruptive draw government ire. The problem here of course is that such behavior fundamentally violates the spirit of free trade deals, such as the WTO rounds or the recent Korea-U.S. Free Trade Agreement. The whole point of such deals is to move beyond economic nationalism and encourage rational consumption: consumers would evaluate goods solely by the ratio of quality (how good is the product) to price (how much they are paying). Americans will recognize that the U.S. cheats on the principle of nondiscrimination with its automotive certificate of origin (COO) rules. Korea is even worse: foreign products are aggressively labeled and often placed side-by-side with their cheaper local clone (see point 3) on store shelves. The foreign product, its price bumped up by all sorts of NTBs, stands in sharp contrast to the local import substitute. Foreign firms, too, routinely face levels of bureaucratic red-tape and politicized auditing in Korea (especially in the banking sector) that lead them to shrink their presence. The great irony of the uber ban is how well the firm actually fits into the current Korean government’s supposed push into services and information. Korea is a manufacturing-heavy economy that is not very competitive in post-industrial sectors. Current President Park Geun-hye has moved to improve this with her “Creative Korea” initiative (CK). This provides seed money to firms and universities around the country to encourage innovative start-ups in a country dominated by massive, slow-moving, rent-extracting conglomerates. Uber is precisely the sort of cool, future-ish app that CK is supposed to inspire. It shows how deep the mercantilist impulse runs in Korea that the government’s first instinct was nonetheless to slap it down, because it was foreign and profitable. The next step is then to clone that successful foreign product, so as to capture its benefits, but deny the foreign firm local penetration. As Samsung in conjunction with the Korean government did five years ago on the iPhone, so Seoul City has said it will do with uber. Not surprisingly, these practices draw tremendous ire from Asia and Korea’s trade partners, particularly the United States. They strike many in the West as unfair, and the necessary flirtation with xenophobia is deeply disturbing. America’s own economic nationalists, such as Michael Lind or Clyde Prestowitz, counsel the U.S. to mimic these strategies so as to prevent “de-industrialization.” While perhaps appealing to those in the West hardest hit by globalization, mutual mercantilism would push the world economy back toward the 1930s. Far better is to relentlessly push the West’s Asian trading partners to open – which has worked somewhat; the trade environment is certainly much better than it was forty years ago – and increasingly tie them into trade deals such as the Trans-Pacific Partnership that make such mercantilist cheating illegal. 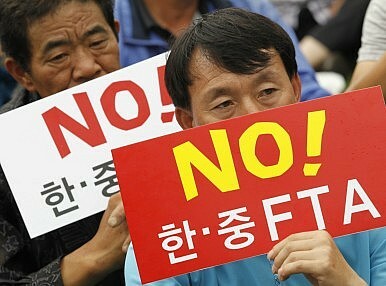 South Korea should not make Japan's mistake and delay on much-needed reforms.